Watermelon is a not only great tasting. It has high water content making it a great thirst quencher. Watermelons are packed with vitamins and nutrients to help keep us healthy. They can keep us hydrated, do wonders for our skin, and help keep our kidneys free of toxins. Watermelons do not contain any fats or cholesterol. They are high in fiber, vitamins A and C, and a good source of potassium. About the only thing that bothers me about eating watermelon are the many seeds hidden inside. It seems as though it takes longer to remove the seeds than actually eating. This made me to experimentation. So here is my result which I am happy with. The following is a simple smoothie recipe that adds some thickness as well as a touch of vanilla flavor. The best part, no having to remove any seeds. Just drink up and enjoy! 1. After chopping and de-seeding watermelon place in freezer for about 30 minutes. 2. 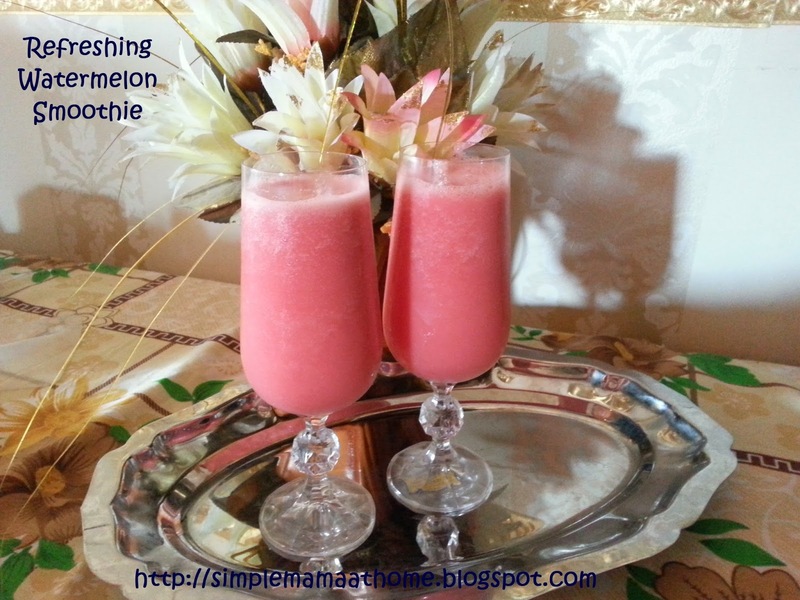 Add watermelon to blender and mix until smooth. 3. Add milk, yogurt, and vanilla. Mix until smooth. Serve. So simple yet so yummy! 1. Watermelon can be classed as a fruit or a vegetable. They are a fruit as they are grown from seeds, have a sweet refreshing flavor, and is loosely considered a type of melon even though it is actually a type of berry known as pepo. They are a vegetable as they are of the same family class as cucumbers, pumpkins, and squash. 2. There are over 1200 varieties of watermelon grown on 96 countries worldwide. 3. Every part of the watermelon is editable including the seeds and rinds. I had no idea. 4. Early explorers used watermelons as canteens. 5. The country where watermelons were first harvested over 5000 years ago is Egypt. During my current stay here I have been very fortunate to have an abundance of watermelon. It is very plentiful here at the moment. The Egyptian grown variety is very fresh and tasty and the best I have yet to try. Do you like watermelon? Have you ever tried it in a smoothie? Hi Bismah, this smoothie looks so good and thanks so much for stopping by and leaving that sweet comment on my crocheted blanket I made! Thank you as well and have a wonderful weekend! Hi Bismah! I love watermelon and this looks delicious and refreshing! Thank you so much for sharing at Best of the Weekend and pinned - hope you're having a wonderful week!